This page shows photos of Braydon's club foot and the repair work he had done. 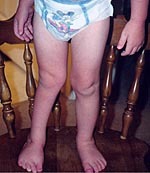 His club foot and toe reconstruction surgery was done on February 29, 1996. Then cast change and foot manipulation surgery was completed on March 11, 1996. Before and after photos are included on this page. This is a photo of Braydon's foot a couple of weeks before his repair surgery. He did not have serial casting done prior to surgery. COUNT THE TOES! We had to come up with extra verses to "This Little Piggy". Braydon's foot was quite a novelty with the kids. Another funny thing was that if he could swim, he would just swim in circles with a rudder like that! Seriously, he had bone structure for an eighth toe once they opened it up during the surgery. I took this picture to show the scarring he has from the club foot surgery. This photo was taken in September, 1998, about 2 1/2 years after his original surgery. Braydon had heel-cord release surgery on January 23, 1997. His ankle is very tight and he does not have very good dorsiflexion in his ankle. This is something we will watch over time and hope heals on its own. More "fine-tuning" surgery may be required in the future, according to the doctor. Taken in September 1998, this photo shows the typical leg that many children with club foot/feet have. Because of the toe repair, his big toe on the right foot will never be as fully developed as the toe on the left foot. Check out these Links for more club foot information, including a great E-mail list of parents who have children with club feet. Everyone is at a different stage of the club foot process and we learn so much from each other. Take the time to sign up for the e-mail list - it is well worth it. New Link!Connor's Page Meet Vicki's Pride and Joy! New Link!Channing's Page Judy's charming little boy! Thanks Judy!